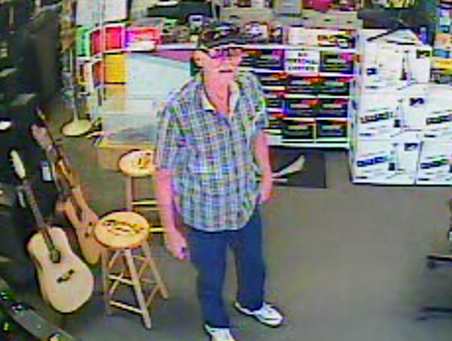 On June 8, 2016 at approximately 2:30 PM, an unidentified white male suspect stole a $530 Seagull guitar from Morell Music, located at 510 East Center Street in Kingsport. The suspect both arrived and fled in a gray Oldsmobile Cutlass Supreme. The suspect was captured on store surveillance video, with a photo taken from that footage included in this release. Anyone who recognizes him, or who may have any additional information that may help solve this case, is asked to contact Detectives in the K.P.D. Criminal Investigations Division at 423-229-9429 or call Kingsport Central Dispatch at 423-246-9111.